Blues has a "Flash"? Good to see that Engrish is alive and well in this game. 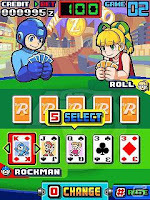 I hope this isn't the stuff CAPCOM meant when they said MegaMan isn't dead. 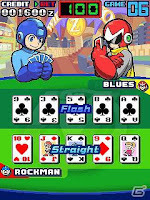 I must be the first to be offended by the apparent omission of Spider in this most poker themed of Mega Man titles. 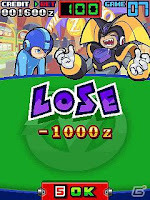 LOL, Forte's artwork is hilariouly awesome! Called it six months ago. At least the artwork is awesome. I want to play it. At least Roll looks adorable when she loses, that has to count for something, right? 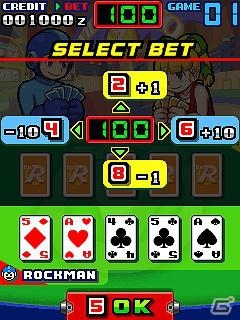 No more lame games and bring new Rockman games, Capcom! Sighing. 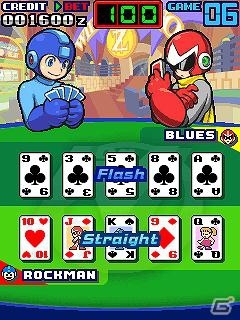 Well, at least this seems to have had a bit more effort put into it than MM Solitaire. 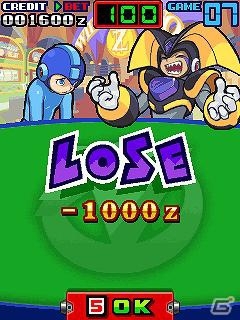 From the screenshots it's not clear if you can use characters other than MegaMan (is it even multiplayer? ), but oh well. The sprites looks nice. I hope someone rips them. 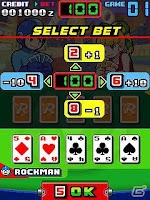 Also Protoman totally has the upper hand thanks to the shades. I used to not care about little worthless tie-ins. But this is insulting. Stop. And who is going to be the last boss? Magic Man? Dr. Wily dressed as Dr. No?